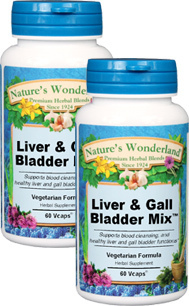 Liver Gallbladder Mix™ - 475 mg, 60 Vcaps™ each (Nature's Wonderland) - Penn Herb Co. Ltd. The liver and gallbladder work together to detoxify the body, promote healthy digestion, overcome sluggishness, support immune functions and more. Keep these vital organs operating at peak efficiency with this traditional herbal blend. BARBERRY…an unparalleled herb for purifying the blood, cleansing the liver and enlivening gallbladder function. WILD YAM…reduces stress on the liver and helps flush wastes from the body. FENNEL, GINGER, PEPPERMINT…powerful digestive aids help the gallbladder with its digestive duties. Help maintain healthy liver and gallbladder function. NOTE: The gallbladder is located just below the liver. It stores bile, a fluid that helps the body digest fats. Healthy liver function affects how the well the gallbladder does its job.